Kerensa: Considering the setting, I feel like this episode should have been wayyyy more exciting than it actually was. But there were some great moments despite the PTSD I now have from the villain dudes exposed chest! I had some mixed feelings on it. I was amused by the setting — maybe the first show to place itself at a sci-fi convention? 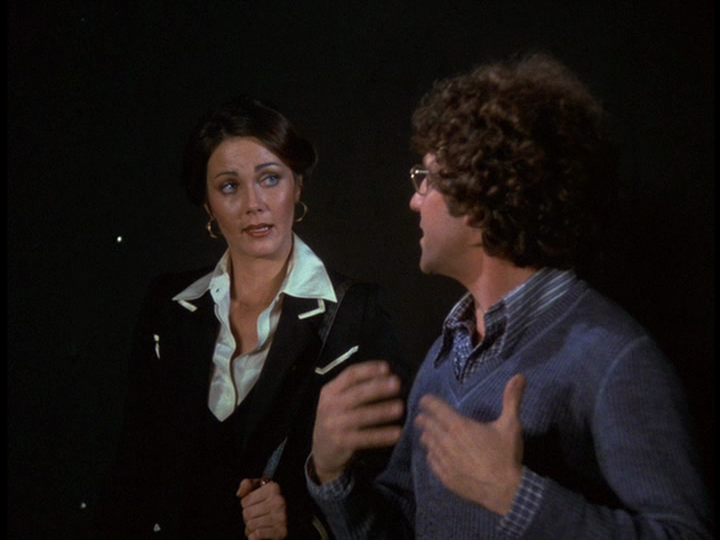 — but frustrated that Rene Auberjonois was in a costume for most of the time. He’s got a very expressive physicality, which you get a sense of earlier in the episode, but it sort of dampened the episode for me. Keresna: I think we should talk about the setting first. I agree with you that it’s a pretty great concept in theory–having all the action surround this sci-fi convention is super fun. And a lot of the costuming and scenarios are pretty great. 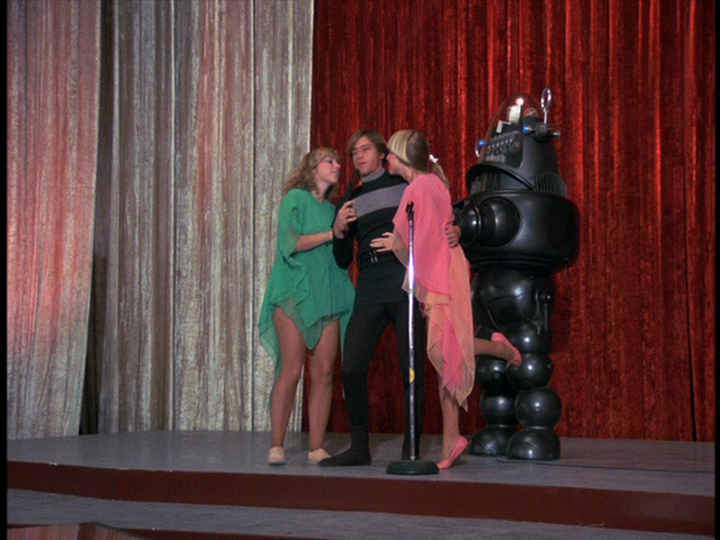 I thought the big robots were funny and was very into the two girls in the pastel chiffon goddess dresses were a personal high point for me. But you mentioned via GChat that you felt that the show looked down at fandom, which considering Wonder Woman, seems pretty ridiculous. Want to talk more about that? Noel: I will admit that I was a bit primed to pick up on it since a friend of mine in grad school railed against this particular episode as being very cruel to fans. I don’t think it was a bad as he made out it to be, but certainly Diana has absolutely zero patience for the folks in costume running about the hotel. It seemed like she would seen check out and maybe go across town, away from the convention, if only the criminal enterprise she was looking to thwart wasn’t located here! And she’s just sort of dismissive and condescending to poor, over-eager Sylvester. I mean, she treats Harold sort of the same way, but at least there’s a little sense of love there. Here? Eh. It isn’t like conventions were new at this point. Sci-fi conventions date back to the 1930s and 40s, and fan practices like slash fiction were on the rise by this point in 1979 — we have records of Man from U.N.C.L.E. slash fiction from the mid-70s, Kerensa! — but I should remember that media fan pathology was/still not as accepted/commodified as it is now. Kerensa: Oh Diana totally wasn’t here for the fans at all. She was totally condescending to them which was something I hadn’t noticed until you had mentioned it. I might not have noticed due to Breaking Bad-induced stress but it was SO apparent at the end of the episode when she’s talking to Sylvester–who she kinda treats like her fan which I was super frustrated with because she just seemed mean. Like you mentioned she treats Harold similarly but is much nicer to him. Slash fiction! Yeah, I’m sure it wasn’t as widely accepted then which seems so strange now considering that literally everything has some sort of rabid fan base. I wonder what 70s Wonder Woman fans were doing. Perhaps the former instance is Wonder Woman critiquing any detractors it may have had who felt that the show had wandered from its roots? Fan letters to CBS or Warner Bros., disparaging them for ignoring and changing things? MAYBE THEY’RE CRITIQUING US FROM 1979, KERENSA. Kerensa: Hahah. Maybe they are! WHY ARE YOU ANALYZING THIS SHOW THROUGH A FEMINIST LENS? FEMINISM, WOMEN, CBS DOESN’T CARE ABOUT THOSE THINGS. Their slogan in 1979 and potentially now still! What else stood out for you in the episode? There were a couple scenes I really liked. Mainly the one when Diana threw that guy in the pool AS DIANA. That was pretty great. Noel: I liked most every scene with Rene Auberjonois, particularly his conversation at a rest stop with the mobsters who hired at him. He’s all cool and collected, doing his stretches while they interrupt his jogging time. Sure, he knows he’s on thin ice with them, but there’s a great sense of confidence in all of his scenes that help sell this idea of Kimball as a master thief. The bits with the goon and the pool were good, as you noted. I also think that it’s the first time I’ve had a legitimate laugh at the show as the goon looked completely at a loss as to how to explain why he was soaking wet (thanks to the lasso), and settled for going for a swim. The show has always struggled to be intentionally funny, and that bit worked well for me. Kerensa: I liked all his scenes too! He just oozed sleaziness to me, I guess it’s hard not to when you are wearing a shirt that’s all the way unbuttoned with all the necklaces. I know he’s a master thief–but the whole crystal thing was so dumb. Also, why did he look so familiar? Was he in a previous episode? I loved that scene too. I also liked the “space fashion show” at the end. Mostly because, how can you not like a good fashion show? UM, what about Diana’s big hair/maroon dress/pantsuit combo at the end of the episode? I loved it and then later I realized I think it was a pantsuit with a dress over it? I have no idea how that works but I’m pretty obsessed with it. Noel: The crystals + potential for laser weapons did feel a little hard to swallow, but at this point in the show’s run, and our discussion of it, I’m trying to let how well the premise for a particular episode works not consume me so long as they can fill it out in an interesting enough manner. This episode sort of passed that particular test as I often kept forgetting about the crystals and chose to focus on the convention aspects. Haha. I was so confused when you called it a “space fashion show.” I don’t know that any costume competition at any convention I’ve been to has been called a fashion show, and I honestly thought you were talking about a real fashion show! On the upside, that whole sequence was actually pretty accurate in how those competitions tend to play out, minus the running around at the end, of course. I didn’t notice the dress but I did notice the ginormous hair. Kerensa: That’s fair. I totally stopped thinking about the crystals as well. That room they were in was super cool though. But I think they referred to it as a fashion show at one point! Which is the only reason why I keep saying that. That hair was AMAZING. OH! The dress/pantsuit is a treat. I will say though, you never see the full thing, so I thought it was a dress for awhile until you could see enough to tell it was the weirdest pantsuit.